A tooth sensitive to heat is usually a sign that the nerve inside the tooth is dying. Unfortunately this process cannot be stopped or reversed once it has started. At some point in the very near future, you will probably need to get the tooth taken out, or get a root canal treatment if you want to keep the tooth. But let's back up a little bit first, and look at the main reasons WHY you might have a tooth sensitive to heat. The FIRST reason is a cavity in your tooth. A cavity in a tooth is full of bacteria. Actually, the cavity is CAUSED BY the bacteria in dental plaque. Anyway, as time goes by, the cavity gradually gets bigger and deeper, until it reaches the stage where it is very close to the nerve deep inside the tooth. The microscopic bacteria can then get into the nerve of the tooth and the nerve becomes inflamed. Read more about this at Tooth Nerve Pain. The SECOND reason you might have a tooth sensitive to heat is a recent filling. If the filling was deep, then it is very close to the tooth nerve. Anytime a dentist has to work on a deep cavity or filling, he will be traumatising the nerve. There's no way around this, if he is to remove the bacteria from the cavity and so prevent the cavity getting any bigger. Read more about this at Tooth Pain After Filling. The THIRD reason is a new filling being a little too big, or too high, when you bite down. If this happens, then the tooth is being constantly "tapped" on by the opposing tooth (the one it bites on when you bring your upper and lower teeth together). The FOURTH reason is trauma; if your tooth gets a knock or a blow for some reason. Maybe you got hit in the mouth by a baseball, or you fell over and knocked a tooth on the ground. Or maybe you were in some sort of accident, like a car crash or a skiing fall. However it happens, the tooth takes a severe knock, and this disturbs the tiny nerves and tiny blood vessels at the tip of the root. Those are the most common four reasons for having a tooth sensitive to heat. How can you tell if it will settle down? Or if the tooth will need treatment? The main clues are; WHEN the tooth is sensitive to heat, HOW LONG it is sensitive to heat, and whether it also reacts to COLD. Let's take these clues one by one. 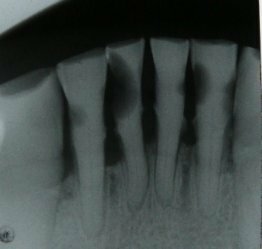 WHEN is the tooth sensitive to heat? Obviously, it's going to ache after you have a hot drink. What I mean is - does it react IMMEDIATELY when you drink (say) a hot coffee? Or does it only start to ache maybe 30 seconds later, even after you have put your coffee cup down? This difference is quite important, and it's probably the OPPOSITE of what you're thinking. If the tooth reacts immediately on taking a hot drink, then the nerve is in a better state of health than if the ache starts 30 seconds AFTER you have swallowed the hot coffee. The chances of it settling down are better. HOW LONG is the tooth painful for after you've had a hot drink? If it's less than 10 seconds, then the outlook is brighter than if it lasts for, say, 60 seconds or more. There's a better chance of the tooth settling down once you get the cause of the problem sorted out. DOES IT REACT TO COLD? If the tooth is also sensitive to cold, and roughly equally sensitive to heat and to cold, then the situation is more hopeful than when the tooth is ONLY sensitive to heat, but NOT to cold. AND if cold actually makes your tooth feel better, then that's bad news. So, in the BEST CASE situation, you might have had a deep cavity in a tooth, which a dentist cleaned and filled for you. And now you have a tooth sensitive to heat BUT ALSO to cold, which reacts immediately when you have a hot drink or a cold drink, but the pain subsides within 10 seconds or so. Most likely, the tooth will settle down on it's own. BUT if the tooth is also sensitive to bite on, then the new filling could be a little too high when you bite. The general rule of thumb here is that, if the tooth has not settled down in about a week, you probably need to go back to the dentist to get the filling adjusted slightly. At the other extreme, if you just have a cavity in a tooth, which is trapping food, which reacts to a hot drink AFTER you have already swallowed the drink, and COLD either makes no difference or makes the pain LESS, then the nerve is likely damaged beyond healing. Unfortunately you are then faced with one of just two options; getting the tooth extracted or getting a root canal to save the tooth. You can read more about these two options at Getting A Tooth Pulled and Root Canal Procedure. So, if you have a tooth sensitive to heat, I recommend getting along to a dentist as soon as you can to get it checked and treated; thinly exception is if you've had a recent filling, and the tooth is sensitive to both hot AND cold, and subsides relatively quickly.